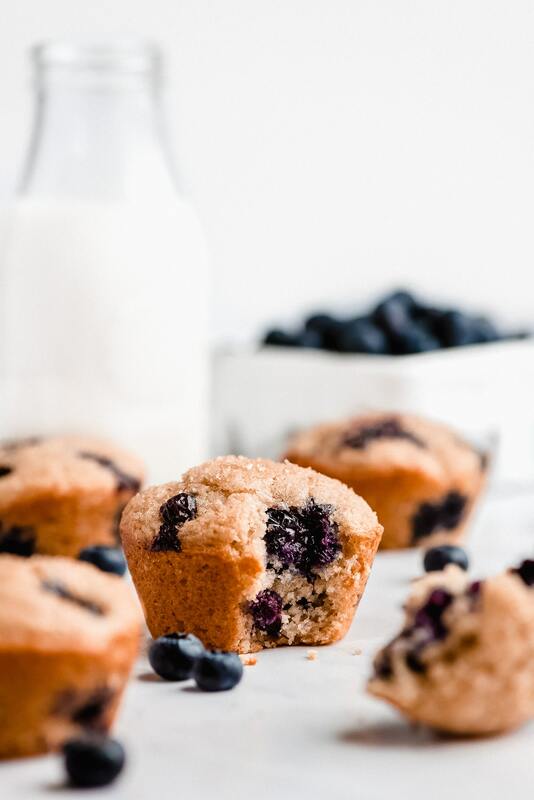 Greek Yogurt Blueberry Muffins are better-for-you muffins that are soft, moist, tender, yummy, and so easy to make. Enjoy them for breakfast or as a snack! It’s berry season! 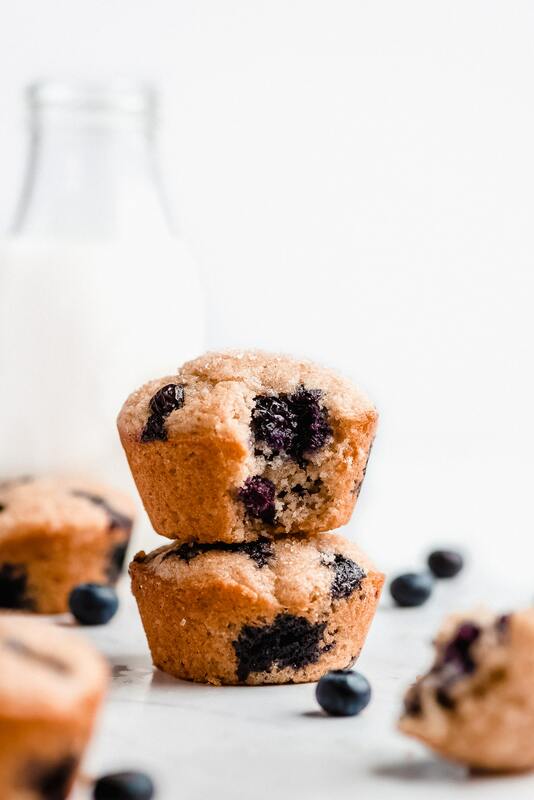 Go grab a carton of blueberries and whip up these delicious healthier Greek Yogurt Blueberry Muffins! They’re great to have on hand for a quick bite as you run out the door in the morning. For more grab-and-go breakfast recipes, check out my Mini Zucchini Quinoa Frittatas or The BEST Homemade Granola. 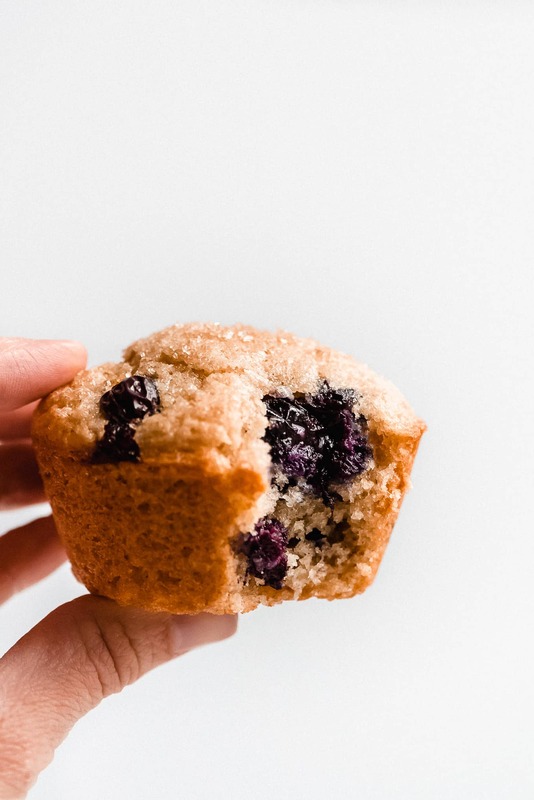 I could eat a muffin everyday for the rest of my life because they’re just so darn good! 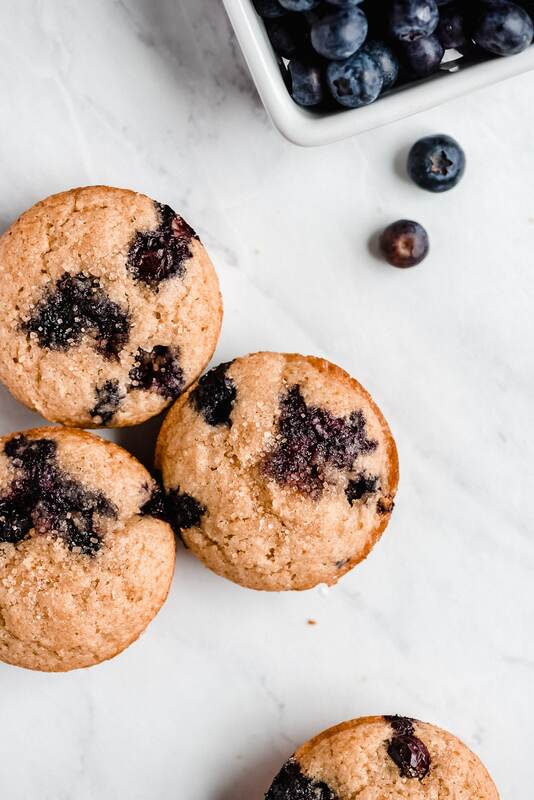 Unfortunately, most muffins are actually more like a dessert but these Greek Yogurt Blueberry Muffins are made a little healthier. Without sacrificing great taste and texture, I’ve swapped some traditional ingredients for nutrient rich ones. Swap out all-purpose flour for whole wheat flour– The whole wheat flour adds more fiber as well as minerals. To make sure that the muffins didn’t get too heavy and dense I used WHITE whole wheat flour. It is just as nutritious as traditional “red” whole wheat but is lighter in flavor and texture and therefore bakes more like all-purpose flour. I also used a tablespoon of cornstarch to lighten up the texture of the crumb. Use Greek yogurt instead of sour cream- Greek yogurt is a great alternative to sour cream. It is very high in protein and low in fat. It also contains probiotics and is a good source of calcium. In baked goods, the Greek yogurt helps in creating that moist tender crumb. I like to use FAGE Total 2% Greek Yogurt. It’s super thick, creamy, and smooth. Swap out the butter for canola oil- Canola oil has more omega fatty acids and less saturated fat than butter making it more heart healthy. Oil also lends to a more moist and tender crumb. Omit the streusel– As much as I love streusel topped everything, it adds a lot of extra calories and sugar. If you must have something on top, sprinkle a little coarse sugar like turbinado sugar (Sugar in the Raw) or large sugar sprinkles. Whisk together all the dry ingredients together in a bowl. In a separate bowl, or in a liquid measuring cup, combine all the liquid ingredients, including the Greek yogurt. Add the liquid mix to the dry and stir with a wooden spoon or rubber spatula until halfway combined. Add the blueberries to the bowl and gently stir just until everything is wet. Scoop 1/4 cup batter into a greased muffin tin. You will fill 9 wells. Press in a few more blueberries in the top if desired and then sprinkle on the coarse sugar. Bake for 19-21 minutes at 350°F or until a toothpick comes out clean. Run a knife around the edges of each muffin and pop out when cool enough to handle. Pick over your blueberries, removing any stems or ones that are squished or shriveled. Rinse the berries under cool water and then let them drain in a paper towel lined bowl for a few minutes. For this recipe, they don’t need to be fully dry. 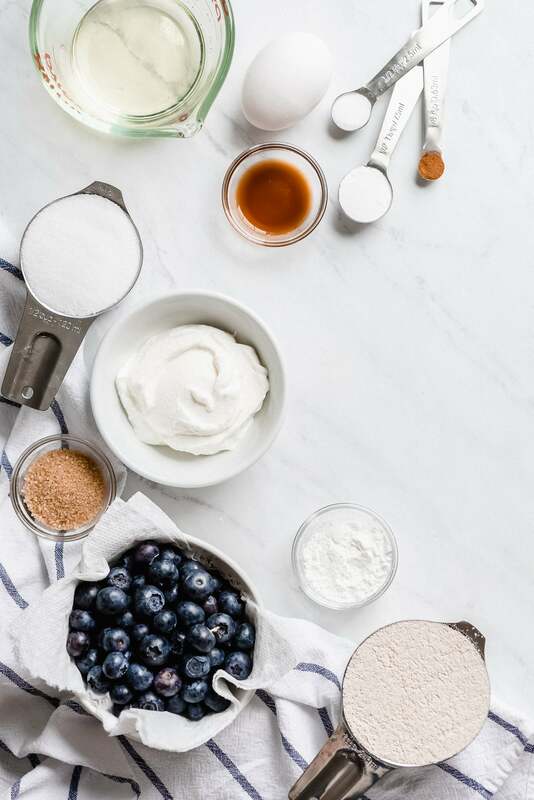 Fold the blueberries into the batter just before the flour has fully mixed in. Use a rubber scraper to gently fold in the berries by pulling the batter from the bottom of the bowl up over the top of the blueberries. Fold them in until everything is just combined. Over mixing leads to a tough muffin crumb. 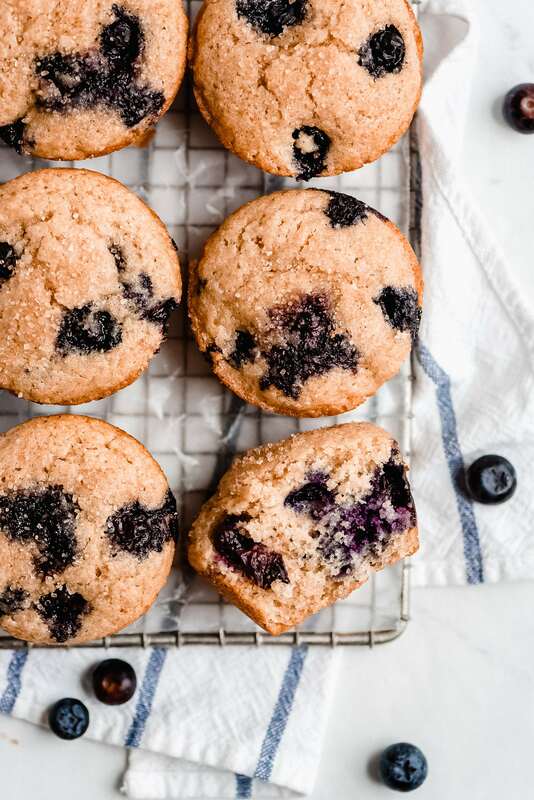 Some recipes have you coat the blueberries in some of the flour so they don’t all sink to the bottom of the muffin. Since the batter for these Greek Yogurt Muffins is quite thick, that isn’t necessary. Liquid Measuring Cup– This baby gets used almost everyday. I love having a glass one because it’s doesn’t get stained, scratched, and it can go in the microwave. This is a must for every kitchen. Trigger Scoop– I love all three of these! The large is great for portioning muffin and cupcake batter, the medium is perfect for cookies, and the small is great for truffles. Don’t feel like baking muffins? 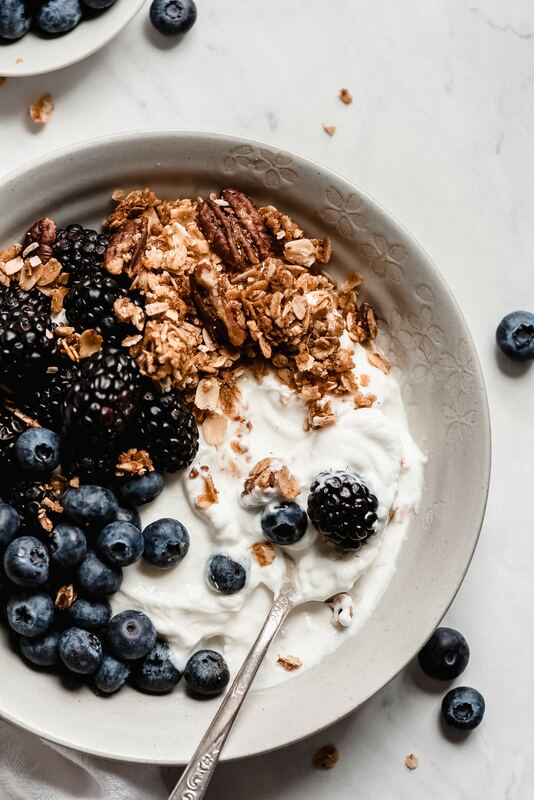 Buy or make The BEST Homemade Granola and add it to some Greek yogurt along with some fresh berries. It’s like a deconstructed blueberry muffin! Greek Yogurt isn’t just great for yogurt bowls and baked goods, you can use it as a marinade (like in Chicken Tikka Masala), in place of sour cream on chili, in place of mayonnaise in Chicken Salad, or as a dip or spread in place of mayonnaise (like in this Turkey Ranch Wrap). What other ways do you use Greek yogurt? Preheat oven to 350°F and grease a muffin tin with non-stick spray. Set aside. In a medium mixing bowl, whisk together flour, sugar, cornstarch, baking powder, salt, and cinnamon. In a separate mixing bowl (or liquid measuring cup) mix together the Greek yogurt, oil, egg, and vanilla. Add the liquid mixture to the dry and mix with a wooden spoon or rubber spatula. When halfway mixed together, toss in the blueberries and fold together until everything is wet and berries are evenly dispersed. Fill 9 muffin tin wells with batter (about 1/4 cup each). Sprinkle the sugar on top and then bake 18-22 minutes or until toothpick comes out clean. Remove muffins from tin by running a knife around the edges. Enjoy warm. Once cooled, store in an airtight container.